Drawing has always been a fundamental skill and good drawing skills allowed artists to grasp the reality around them. At the turn of the millennium, however, the general impression was that with the wide availability of computers, scanners, digital cameras and image software, drawing would dwindle into a marginal activity. In fact, the opposite happened: the enthusiasm for digital imagery died down and the ability to draw has become a treasured skill. In the art world, attitudes to drawing have also changed. Drawing became a way of making a statement as an artist, of showing masterly skill something that up to then had been most commonly associated with painting. After centuries in the shadow of its more illustrious fine art relatives, drawing started to be appreciated for its own sake, as an art discipline, an end in itself, an art form. 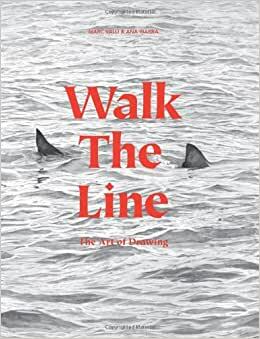 Walk the Line: The Art of Drawing includes interviews with the international selection of artists, as well as examples of their work. It will appeal to anyone interested in contemporary art and illustration. Ana Ibarra graduated in Philosophy in Spain, where she was born. She came to London to study Product Design. She is currently one of the editors of Elephant magazine. Marc Valli is the co-founder of retail and book-selling company Magma in the UK, and of visual art magazines Graphic and Elephant. He is the author of RGB (Reviewing Graphics in Britain) and co-author of Microworlds (Laurence King). I was asked to give this as a Christmas gift. They seemed pleased I listened. 2.0 颗星，最多 5 颗星It's out there. I was hoping for a better mix of traditional drawing and modern examples. Not many examples that speak to me. More details would be helpful. This substantial volume is a 'Turtleback' I believe, meaning that it has extra-thick covers, even heavier than most 'actual' hardbounds, roughly cut to exactly the same size as the paper and left exposed, giving it an efficient, no-frills vibe that is still somehow appealing. It isn't smyth-sewn, however, like a true hardcover, but is instead bound like a paperback, with the pages glued together at the spine. The paper-stock is a little cheaper than the kind found in another, nearly identical and equally recommended Lawrence King artbook, 'A Brush With The Real', which also happens to share the same editors as 'Walk The Line'. This pulpier stock, however, is justifiable for the mostly monochromatic drawings that populate this book, despite the fact that I believe the one small area publishing that should never use cheaper paper to satisfy environmental concerns is the relatively small Art Monograph industry. Cheap materials give the impression of a disposable item; quality materials, beyond being far better suited for reproducing paintings and photos, give the impression that the book is an art object, to be kept and treasured... ironically, this option serves environmental goals better by keeping products from ending up in a land fill. But I digress... The 320 pages in this book are used to maximum effect, introducing some 65 artists who are mostly well-kept secrets finally exposed to a wider audience. As a long-time reader of Artforum, Art News, Juxtapoz and Hi-Fructose, I was shocked at how few of these artists I had a previous knowledge of, and how many of them were incredibly talented and original. Of the 65, I'd seen the work of only a handful, with Winnie Truong being the most popular of the bunch. This may have to do with the Art worlds' disdain for pens and pencils, or it may be related to the overall youthfulness of the contributors. Regardless, discovering the work of artists like David Jien, Stephen Walton, Juul Kraijer, Ethan Murrow, Joe Biel and George Boorujy makes this book well worth its price; the editors are obviously individuals with great taste - their selection of contributors for the above-mentioned 'A Brush With The Real' was even more shocking for me, revealing a treasure trove of figurative painters that had somehow evaded my attention. If you like 'Walk The Line', as I'm sure you will, give the other book a look. Comparing this Anthology to something like Taschens' 'Art Now: Vol. 4', it becomes evident that Art Now doesn't measure up; out of 700 pages only about 50 feature interesting work, and its all work i'm familiar with. The rest is past-prime conceptual pretension that inspires no feelings beyond mild irritation and sardonic giggles. Why is it that conceptual art is always made by idiots who wouldn't know a decent concept if it chewed their face off? Anyhow. 'Walk the Line' is excellent. Buy it. Or steal it. Or don't, its pretty cheap. Great. Unconventional, exciting, varied group of artists. Really fantastic.